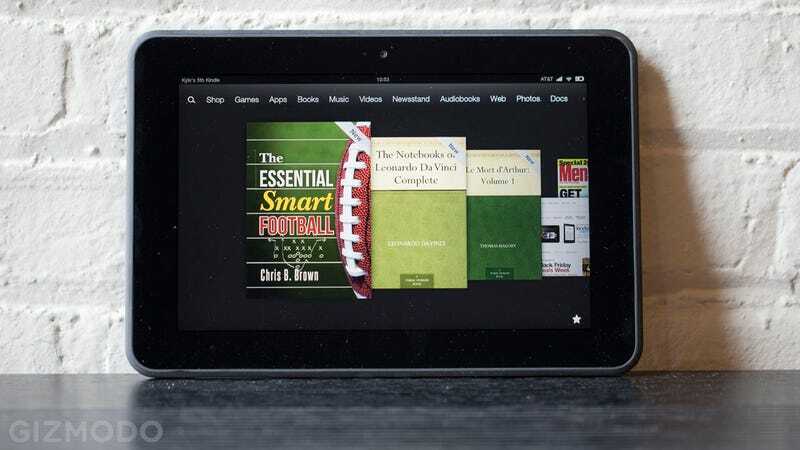 Kindle Fire HD 8.9-Inch First Impressions: Is This the Comfiest Big Tablet? The Kindle Fire 8.9 just showed up on our doorstep. It looks as lovely as we remember it. And instead of banging out a half-baked review in a day or two, we're giving you our quick impressions of it, and will chime in with a full review later. The first thing you notice is how much nicer the 8.9-inch tablet is to hold one-handed than a 10-inch tablet (and especially compared to the 11.6-inch convertibles). That's partially because of the largeish bezel, which makes it nice to hold. But because of that, partially, it's not small in the way the iPad Mini is. The Mini feels like a really big small tablet, while this one is more of a small big tablet. Comics, for example, are totally readable without zooming in. Speaking of the screen: It's great. We did a quick, unscientific comparison against the Nexus 10's monster of a display, and the Fire mostly held its own. Its blacks are a little blacker, though the Nexus looks a little brighter on a white background (though there's some disagreement here about that). Text looks lovely on both, but the whites are different. At a glance, the Kindle's contrast seems easier on the eyes while reading. Beyond that, it seems to be the same Kindle Fire firmware we saw in the 7-inch Fire HD, but we'll let you know if anything changes. And now we're taking requests: What do you want to know about this thing? We'll answer you in the comments, and update this post if anything interesting turns up.